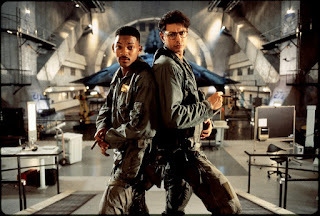 When it comes to the 4th of July, we typically think of fireworks, patriotic decorations and occasionally we also think of Will Smith kicking the crap out of aliens. 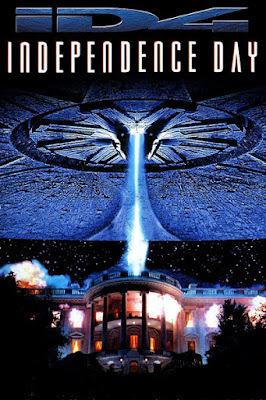 Yes, 1996’s “Independence Day” was a smash hit, the second highest grossing movie worldwide behind “Jurassic Park” and it has sense become of staple for summer blockbusters to draw inspiration from. It also began a yearly tradition of having a new Will Smith blockbuster premiering in July, which as a kid was something l always looked forward to. Will Smith was one of my absolute favorite actors I grew up with, and sense he isn’t quite as active as he used to be, I wanted to look back at the Sci-Fi hit that launched his career. 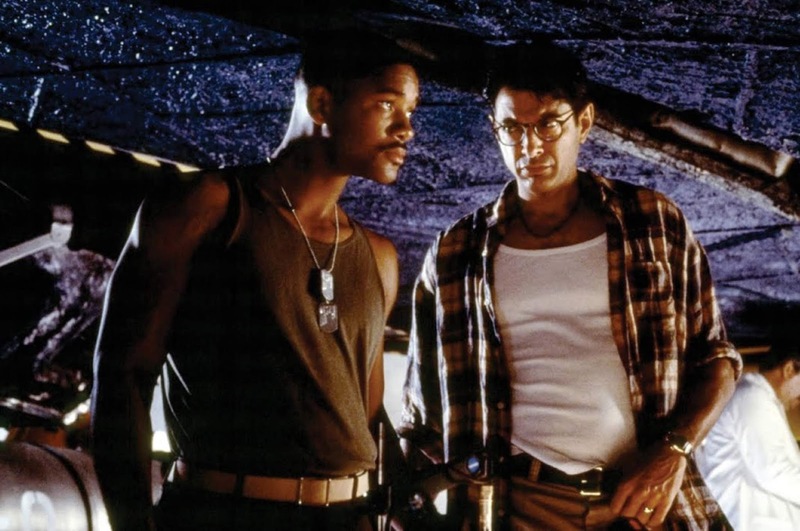 Over the years, “Independence Day” has developed a love it or hate it relationship with viewers, and for me, while I’m not a die-hard fan, I’ve always looked back on it a Sci-Fi classic in its own right. So, let’s see how much of it has held up over the years, as well as the impact it made back in the mid 90’s. The plot is a very strait forward global invasion, with a fleet of giant flying saucers launching multiple attacks in major cities. As the invasion ensues, we follow various survivors across the United States, including the calm, yet deeply concerned president who’s overseeing the military operations. A tech-expert cable guy who gains access to the alien’s frequency signals. A goofy crop duster who’s sworn for years that he’s once been abducted by aliens. Then finally, we have Will Smith as a tough as nails Marine piolet. I really like that there isn’t a definitive main character, just a collected group, all stereotypes, but memorable, and mostly likable. 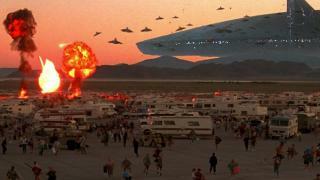 The multiple groups eventually converge at area 51 in the Nevada desert, where they organize a counter strike against the invading army. Thus, a full on battle for the fate of the entire world takes shape on Independence Day. In essence, this film is like a throwback to the classic alien invasion movies from the 1950’s. In fact, the film seems to take direct influence from the 1956 movie “Earth vs the Flying Saucers”, but it thankfully isn’t a direct remake either. This film also takes lots of inspiration from H. G. Well’s “War of the Worlds”, right down to a metaphorical virus being man kinds salvation. The one difference between this film, and all the alien invasion movies that came before is that “Independence Day” was the first to be presented on a great big, grand, and destructive scale. This was the first time the concept of an alien invasion felt like a huge event, and the larger than life visuals sustain the feelings of both excitement and dread when seeing these massive ships emerge from the sky. Looking back, the effects have aged very well, and truthfully, I think they look better than most disaster movies we see today. This was back at a time when movies would combine the new CGI technology with practical models, sets and even practical explosions. 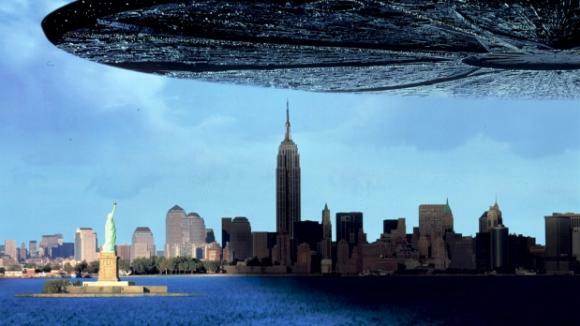 The big show stealer is when the alien ships launch their attacks on Washington, LA and New York, and it’s still a colossal feast for the eyes all these years later, especially when acknowledging the practicality of the sets on display. The scene with the white house getting blown up is in its own right a classic movie moment, as well as an effective marketing tool that was all over the posters and trailers for this film. While the image of historical land marks in ruins has been done before in films like “Planet of the Apes”, this was the film that influenced countless other summer blockbusters to feature wide spread city destruction, and famous land marks getting disfigured. Naturally this film won the Oscar for best special effects, and also got a nomination for best sound design. Putting aside the spectacle, my absolute favorite aspect of this first attack, and even the film in general is the buildup, as the aliens don’t attack the second they arrive. The ships initially remained in orbit for several hours, and it’s great to see the different reactions on display from the people below. We see the cool and collected military attempt to establish communications, as well as keep people safe. We have the masses fleeing in terror at the sight of these giant ships, and we have the select radicals who are ecstatic to welcome the new visitors. My favorite visual of the whole movie are the massive shadows casted by the ships over all the towns and buildings below. All this, along with the pacing helps put the audience in a mind-set of a real-life event that’s slowly unfolding. However, once our heroes discover the alien’s hostile intents, it leads to a riveting sequence of them trying to escape before all the bombings even commence. The scene in which the character David looks at his monitor and chillingly declares that “Times Up” has always stood out as an effective moment. It’s largely thanks to all this setup that the destructive spectacle makes an impact on us viewers. The action also comes in the perfect variety and gradually builds over the present day course of the film. First we’re introduced to the giant flying saucers, and then we see them attack the cities. Next, we’re introduced to the smaller attack ships that engages military piolets in the air, as well as attack nearby bases. Then we’re finally introduced to the aliens themselves, and then we see them attacking the survivors. At last we get the big battle of Independence Day, which is a combination of everything that we’ve seen before. It’s an absolutely perfect templet for a summer action movie that completely avoids repetition. One of my favorite action scenes is when the marines have their first engagement with the fleet of smaller attack ships, because the reveal of the alien shields raise the stakes, plays with our expectations and illustrates just how outmatched the humans are. The following dog fight between Will Smith and the alien piolet in the canyon always made for an entertaining highlight. Perhaps my favorite Will Smith moment of all time is when he knocks out the alien by punching it in the face, and then following it up with “Welcome to Earth”. One of the more effective and freighting scenes is when the president attempts to talk to the alien in the medical room, where all hopes for peace are shattered when the creature says strait out … we want you humans to “DIE”. 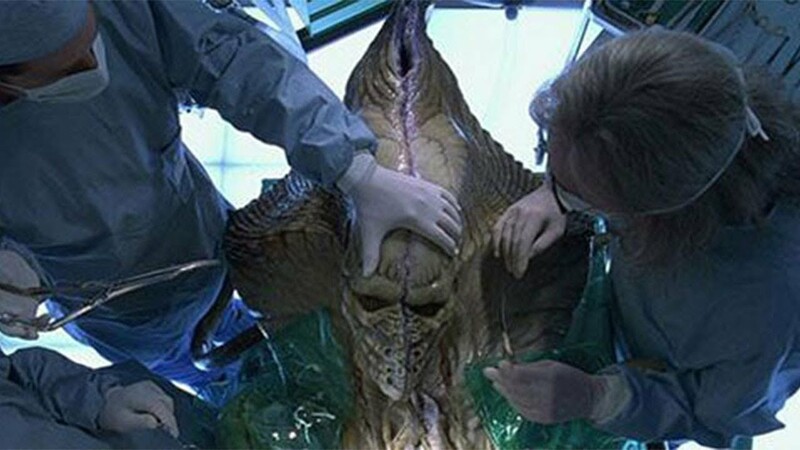 The whole scene was shot like a horror movie, and probably features one of my all-time favorite jump-scares when the doctors initially cut open the aliens space suit. This dose lead me to one of my issues with the film, and that’s the aliens themselves. While their ships and fleets always posed a threat, I found the creatures themselves to be very generic, both in design and conception. The good news is that the film wisely focuses more on the saucers rather than encounters with the aliens themselves, because they always came off to me as just stock, boring aliens. Let’s finally talk about the characters, as the film thankfully never over steps its bounds in trying to make them interesting. While all these characters are likewise stock survivor characters, the cast is exceptionally talented in making them all stand out, and the movie gives us just enough of a reason to care for them without distracting us from the overall fun factor of the movie. Will Smith naturally steals the show with his trade mark cool factor, but this was also the first time he proved himself a capable action star with both an electrifying screen presence, as well as funny charm that was all his own. This film of course was another bright spot in Jeff Goldblum’s career, as he played the witty, goofy tech-guy who ultimately saves the day. It’s hard to explain, but Jeff Goldblum has always had this natural screen appeal playing characters of this sort, and I couldn’t imagine this film feeling the same without his presence. One of my favorite aspects of this movie is that it keeps the President as a main character, as opposed to a side player that just needs protection. It was just really cool to watch him get involved, and Bill Pullman really shines in the role. His big Independence Day speech at the end, while overly patriotic, over sentimental and honestly quite clichéd, is still a rousing speech that delivers an honest and heartfelt message that anyone can get behind. 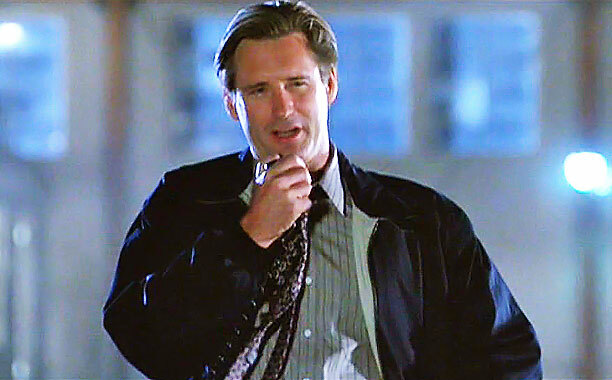 Whenever I think of an epic, clichéd battle speech, this is the one that always comes to mind first. 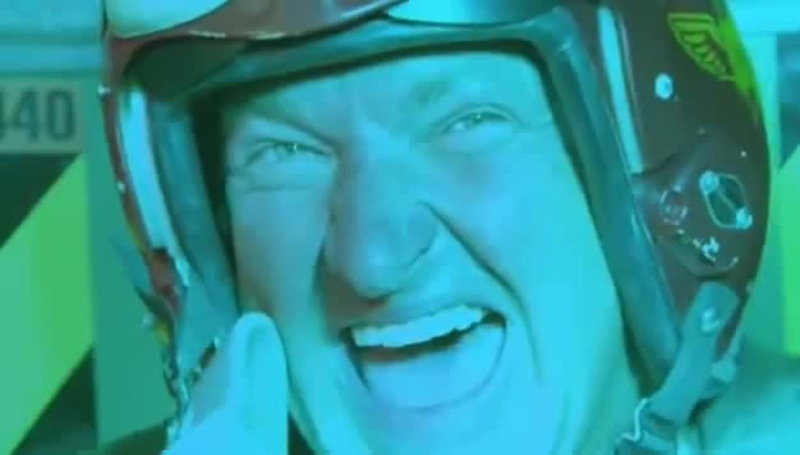 The only character that just felt like added fodder to me was the crop duster played by Randy Quaid. While the performance once again is memorable, I just never cared about him or his family, and just got irritated whenever the film would cut back to them on their travels. 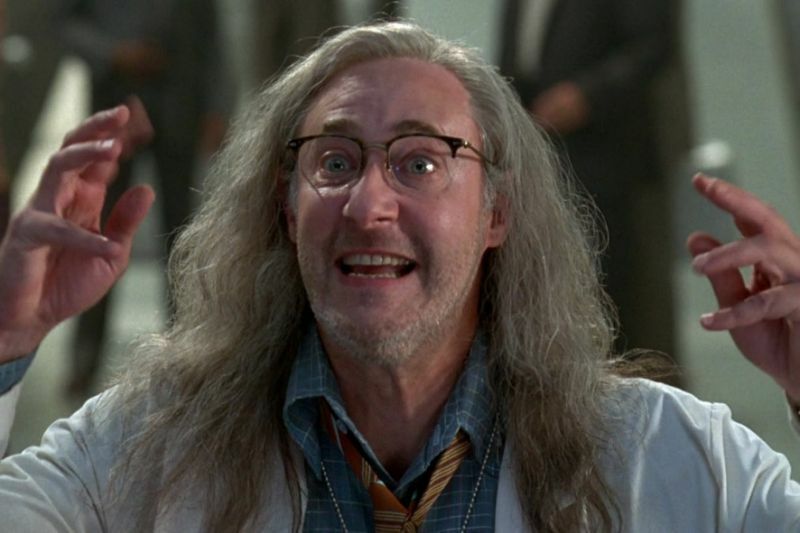 Even the smaller supporting roles are memorable, like Brent Spiner, fresh off of “Star Trek: The Next Generation”, playing the quirky scientist. We also have the beautiful Vivica A. Fox playing Will Smiths wife Jasmine, and it’s great to see the young Mae Whitman as the Presidents doubter before she became a star in the world of voice acting, among other things. The last thing to talk about is the climactic battle of Independence Day, and personally, I’ve always looked back on this as one of the most memorable final battles in science fiction cinema. When the alien mother ship orbits over their base, our heroes retaliate with a full-on air battle assault, and it’s such a thrill to see basic fighter jets combat alien attack vessels. It was also rousing to see the humans finally unload some damage on their ships. Now keeping in tone with the film, this final battle gets very cheesy, but I love it all. It’s awesome to have the president leading a squadron of ships into battle, which is admittedly ludicrous, but I still love it. Also, while I didn’t like Randy Quaid’s character very much, his sacrifice which brings down the alien ship is a shining example of Red-neck heroism on film. However, my favorite aspect of this whole third act is seeing Will Smith and Jeff Goldblum fly a stolen alien ship into the mother ship in an effort to bring down the entire fleet. Seeing these two talents play off each-other is an absolute delight, and their daring escape leading up to the ships explosion is absolutely the most exciting of its kind sense the climax of “Return of the Jedi” in which the Rebels blew-up the Death Star from within. 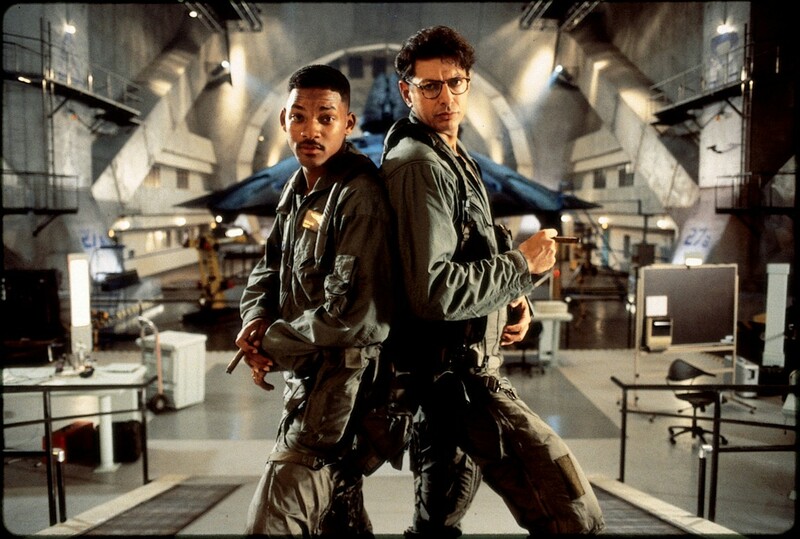 In the end, I can’t call “Independence Day” any kind of masterpiece, but I’ve always had a lot of fondness reserved for the film. It’s one of those movies I don’t think about, but whenever the 4th of July comes around, I always feel a little excited about watching it again. Despite not containing a single original idea, there’s just a real sense of charisma, energy and excitement that comes with the whole package, and makes it work. There’s also a genuine sense of high stakes, and some reasonably good tension that fits along with the films overall fun factor. I do think that the film was a big influence on summer blockbusters to follow, but weather that’s a good or bad thing is up for debate. The overabundance of disaster movies in the late 90’s was grading, and clearly steamed from the popularity of “Independence Day”. On the positive side of this coin was a steady reemergence of the Sci-Fi genera, which up to this point had been in limbo. While successful television shows like “The X-Files” set things in motion, it was “Independence Day” that brought crowds of fans back to the excitement of outer space and alien encounters. For all its short comings, I do think it holds up as one of the all-around best alien invasion movies, and I don’t think I’ve seen one sense that’s left quiet as memorable an impact. I give the 1996 classic “Independence Day” 4 stars out of 5.